Neal Peterson, beside Eros at Mia, featured near the center of his Minneapolis collage. 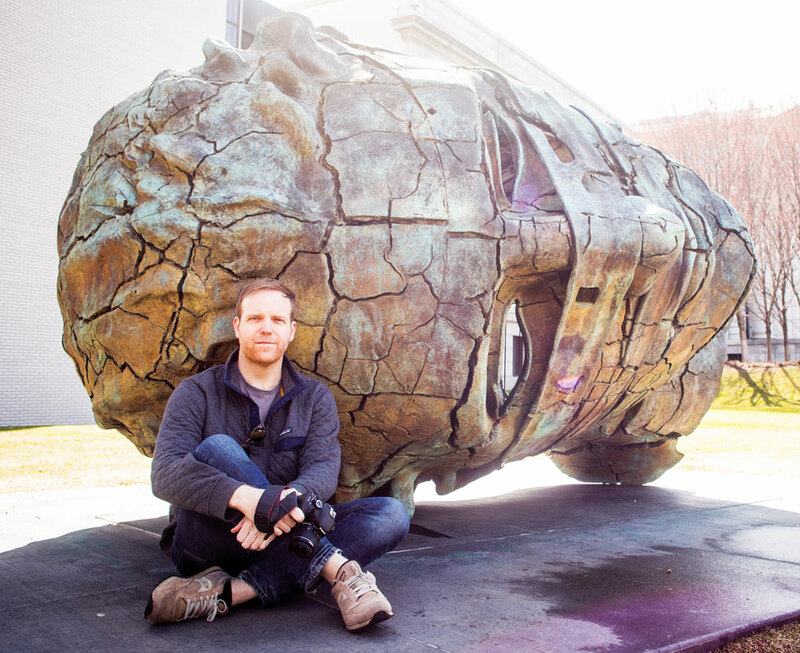 Neal Calvin Peterson has always loved travel, Buddhist and Hindu art, photography, maps, and graphic design. 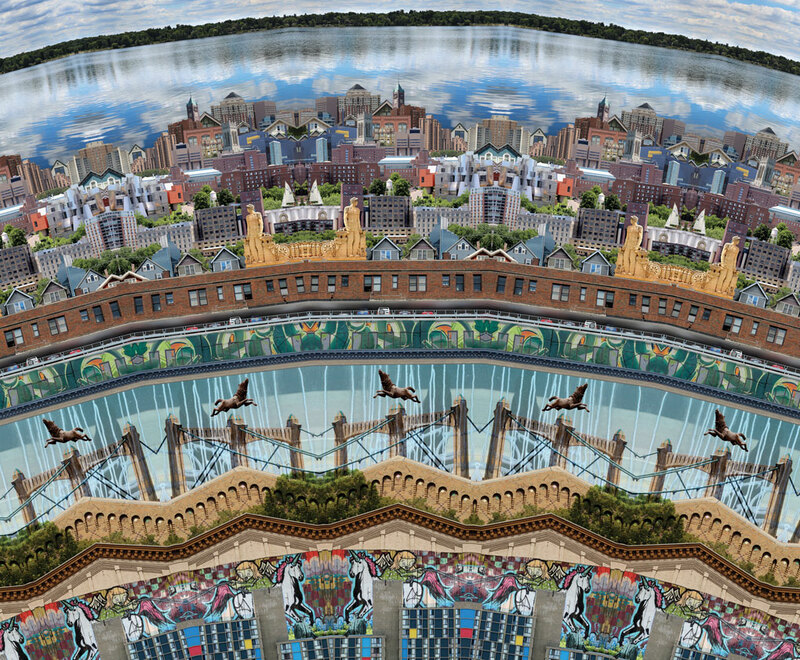 Last year, he combined them all into mandala-shaped, photographic collages of cities. After Wetransfer.com featured his work—and it became the most-clicked-through art for the year—Moooi Carpets in The Netherlands took note of his work. Soon, a partnership was born. 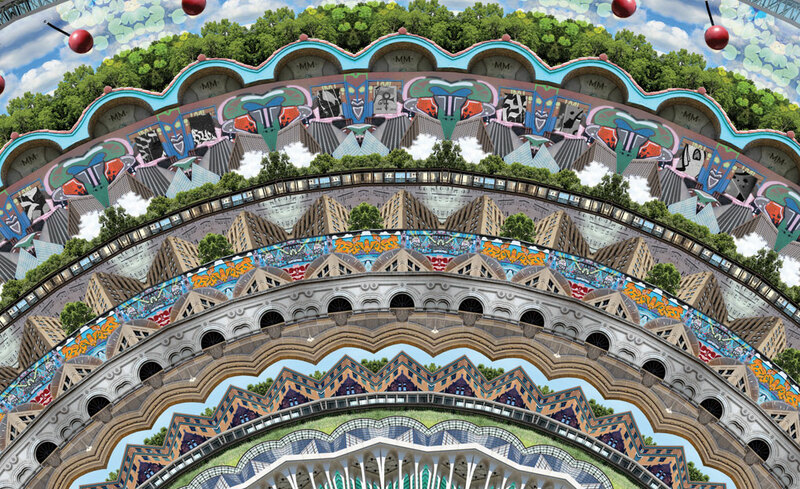 Moooi began printing Peterson’s collages—of Mexico City, Minneapolis, Reykjavik, Vancouver, and Chicago—onto circular cotton rugs and included them in its Signatures Collection. In April, Moooi showcased the rugs at the Salone del Mobile in Milan, Italy. “These kaleidoscopic microcosms represent the oneness and connectivity of a city and its people,” Moooi writes of Peterson’s rugs. In addition to designing his urban mandalas, Peterson teaches design, typography, and experimental mapping at the Minneapolis College of Art and Design. He recently completed an infographic on musical notation systems from around the world for the Rubin Museum of Art in New York, which is dedicated to art of the Himalayas, India, and neighboring regions. A city is a manifestation of the people who live there. It’s a creative expression based on materials available and stylistic preferences. I think of a city as an abstraction of a natural space. A modern city like Hong Kong is an extreme abstraction; a city like Timbuktu, where the homes are made out of natural resources available in the region, is a lesser abstraction. So I walk around a city and take hundreds of photos. It’s not until I start composing images that the feeling and aesthetic come to life. Then I know what the city—its colors, its architectural patterns—looks like. I digitally collage the images on a computer. 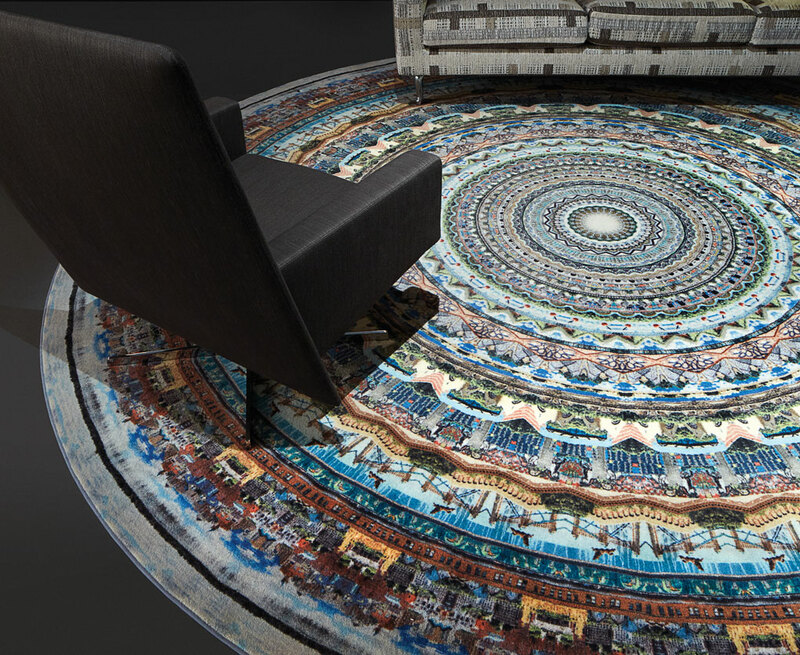 Moooi takes my files and turns them into rugs. How do you pick the cities? That can be tricky. I look for cities with unique characteristics. Minneapolis is where I live. It’s my favorite city. We have the stereotype of being a cold, wintery town. So I wanted to capture the city at the height of summer. You can see the lakes, blue summer skies, and lots of greenery in the rug. Reykjavik, on the other hand, has always been a mystery to me. It’s so isolated and on a volcano, and very Scandinavian. When my flight home from Reykjavik was delayed, I laid in a grassy field as the fog was coming in and, as a result, put a layer of fog over the mandala. I feel drawn to Buddhism and its principles, and I’ve always loved the philosophy of the mandala. 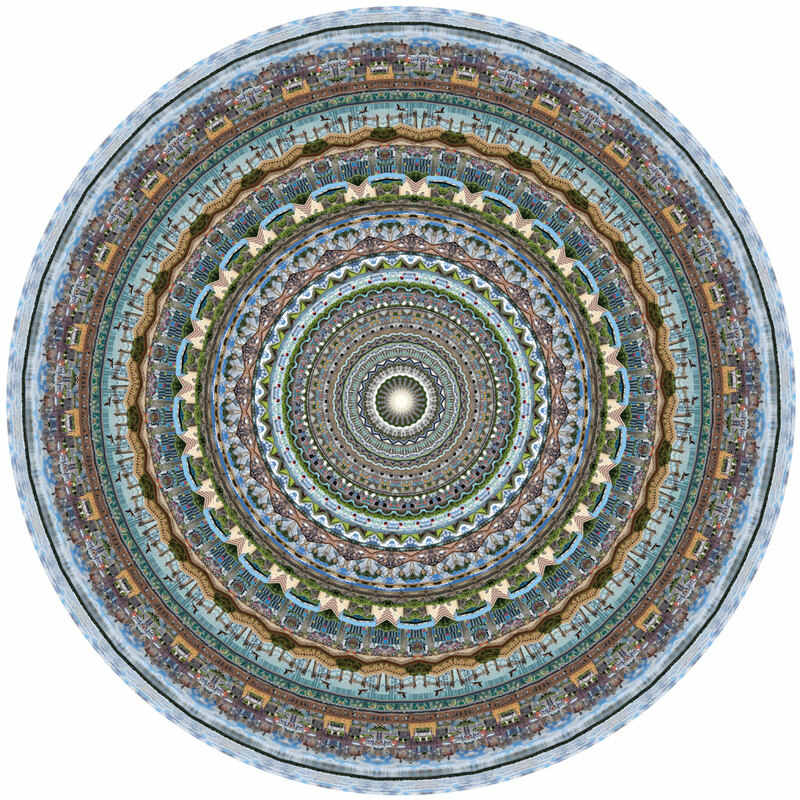 Within Tibetan Buddhism, the mandala is a map of the universe presented in a state of harmony or idealism. I apply that to cities in my work. Cities are a microcosm of the bigger picture. I’m an advocate of peace. I think about how communities are connected. I’m trying to represent an urban area in its ideal state or a state of harmony. What will be your next city? Paris. But I’ll also hit some other cities in Europe. I’m going to follow the weather and see what interests me, but there’s amazing modern architecture in the Netherlands and Brussels.